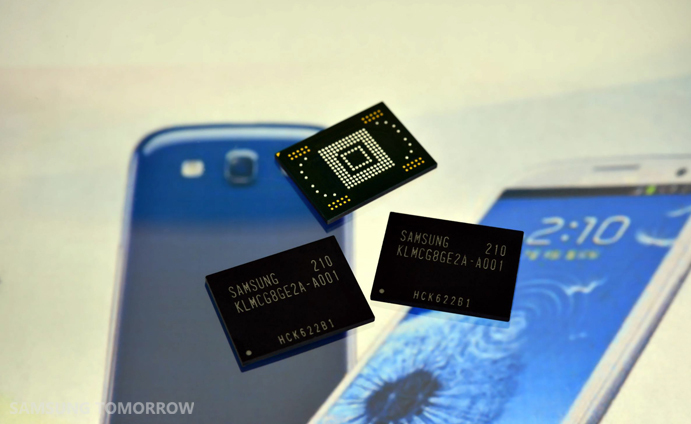 Today, Samsung announced that they have begun production of the industry’s fastest embedded NAND storage. The production model name is the eMMC Pro Class 1500 and will come in 16GB, 32GB, and 64GB size options delivering read speeds of up to 140MBps and write speeds of an equally impressive 50MBps. Based on Samsung’s testing, in comparison to previous eMMC offerings, it is four times faster in random reading and writing – processing up to 3500/1500 IOPS (inputs and outputs per second). The benefits from speeds like these will most definitely be noticed in system-wide applications such as the galleries, file browsers, HD video and 3D recording, high-performance mobile games, and things of that nature. Samsung did not mention specifics for when we can see these in devices, but with volume production taking place already, our guess is by the end of this year or maybe sooner.